Tiger Woods's 14-month spell as world number one could come to an end at the Players Championship, which gets under way at Sawgrass on Thursday. Australia's Adam Scott, Sweden's Henrik Stenson and Americans Bubba Watson and Matt Kuchar could all overtake Woods, who is recovering from back surgery. Woods won the tournament in 2013, finishing two shots clear of the field on 13 under par. 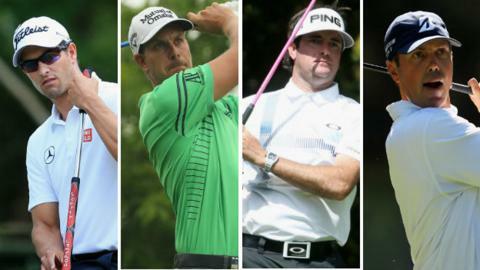 Known as the 'fifth major', it features eight of the world's top 10 this year. Australian Scott, second in the rankings, will move ahead of Woods with a top-16 finish, while world number three Stenson will do the same if he is in the first six on Sunday evening. Tiger Woods has spent a total of 682 weeks at the top of the world golf rankings. He first climbed to world number one as a 21-year-old following his 19th-place finish in the 1997 US Open. He had won his first Masters title earlier that year. Watson, who clinched his second Masters title in his last outing, would need to have sole possession of second place or better to surpass Woods and Kuchar has to win the tournament to overtake the 14-time major winner. "I'm here to win golf tournaments," said Scott. "That's been the goal and from that you can get to number one in the world if you win enough, often enough. "I've had a couple of good chances this year already and haven't been able to pull it off, not because it's been weighing on my mind but I just wasn't sharp enough playing the last couple of rounds at a few events." Bizarrely, Scott could have overtaken Woods by not competing this week, owing to the way the official world ranking system works. "It's just the way it is, I guess," he said. "It's a very hard system to perfect." The Sawgrass course's signature hole is the 137-yard par-three 17th - with an island green surrounded by a raucous gallery of spectators. Northern Ireland's Rory McIlroy and Graeme McDowell and England's Lee Westwood and Luke Donald will be among those trying to register only a fourth European victory since the tournament began in 1974.